Drawing on the origins of American sportswear, the Woolrich half zip jumper boasts a quality cotton construction with a stand collar and a contrasting stowaway peaked hood. 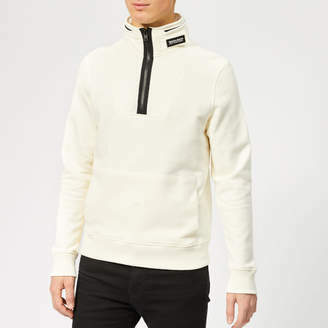 The pullover is detailed with long sleeves, a front kangaroo pocket and a rib-knit hem and cuffs for a comfortable fit. A branded Velcro tab sits on the collar. Tonal stitching throughout.Main: 100% Cotton. Hood: 100% Polyamide.